The City of Clinton was established in 1855 at a strategic location along one of the country’s busiest waterways. The City soon after was also connected by railroad to Chicago and points west. 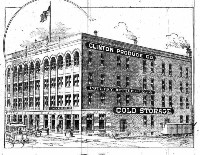 This superior access to transportation was an important factor of Clinton’s thriving lumber and millworking industries, which distributed raw material and finished millwork across the country. This in turn created a concentration of wealth which made possible construction of the city’s large mansions, extensive residential neighborhoods, public buildings and thriving downtown. Stop by our office for a printed brochure of this tour! 1. Your tour will begin at the Clinton County Historical Society Museum on 601 South 1st Street. The 1858 J.C. Bucher Provision House provided supplies for the early riverboats which were loaded out the east door directly onto the boats until the swamps were drained for the railroad. It remained a commercial building where lumber, oats, cement, horsehair, sand and commodities were sold until it was bought and revitalized into a museum in 1995. 2. Head West on 6th Avenue South to 2nd Street and to your left is the Lafayette Hotel. This hotel was a “state of the art” venue for vaudevillians that appeared in Clinton and often stayed there, including world-famous entertainer Lillian Russell, whose hometown was Clinton. 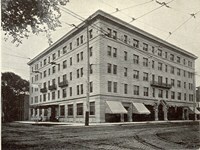 Construction for the Lafayette Hotel began in 1904 with the removal of the original frame building on the site (one of which was a stop on the “Underground Railway”). The hotel was known as the Cromwell Hotel until shortly before it opened when it was named after its key investor, Lafayette Lamb. The hotel was opened in 1906, and at the time was said to be the finest hotel in Iowa, as well as the finest (or one of the finest public buildings) in the Midwest. It was to provide first class accommodations for the artists who performed in the Davis Opera House and the Clinton Theater. The interior was finished with marble, mahogany wainscoting, decorative tile and art glass throughout. 3.Take a left on South 2nd Street and go two blocks to see the Moeszinger-Marwuis (Armstrong) Building*. The building is a good local example of Romanesque Revival Style. C.E. 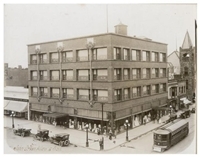 Armstrong and Company, established in 1878, and wholesalers of hardware, plumbing heating and mill supplies, had occupied the building since 1932. It has been preserved and now houses the Chamber of Commerce offices on the first floor and apartment on the upper floors. 4. Turn right on 8th Avenue South, along the bridge. As you come to South 3rd Street, turn right, the Carniege Library* will be in front of you. This was the work of Chicago architects Patton and Miller. The Carnegie library was donated to the City of Clinton in 1904 by the famous Carniege Foundation that built hundreds of libraries across America and in many foreign countries. 5.Continue on South 3rdStreet; take a left on 7thAvenue South and on the west side of the YWCA is the Lafayette Lamb House*. Built in 1877 with red brick, mansard roof, and turreted tower the building was rebuilt in 1906. The roof was rebuilt as a flat roof and the tower was removed. Built as the mansion of a lumber baron, the house was donated to YWCA in 1920. 6. Continue on 7th Avenue South taking a right on South 4th Street to view the Roosevelt Building on the corner. It was built in 1888 and served as the Clinton High School until 1921, after which it became the Roosevelt Elementary School and is now used for the offices of the Clinton Community School District. 7. Proceed up South 4th Street and turn left on 5th Avenue South; go half a block, on the right is the George M. Curtis Mansion*. The mansion was built in 1880 by one of the three brothers who founded the Curtis Woodworking Company, which manufactured and sold wood trim throughout the nation. The home was sold to the Clinton Women’s Clun in 1920 and has been preserved as a gorgeous period home furnished with fine antiques, ten fireplaces, stained glass windows and two staircases. The original lacy wood porch was removed in the 1940’s and was replaced by a wrap around one. 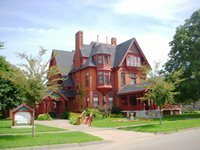 For a guided tour, contact the Clinton Women’s Club at (563)242-8556. 8. Head back to South 4th Street and turn left, take a right on 4th Avenue South, the Whitney-Merkley Mansion is on the right side. The building has been successfully converted from residential to commercial use. The home was built in 1884. No children ever lived in it and is now the Wolfe law offices. The home is diagonal from the historic Sacred Heart Church which was interestingly once the home of the American Protective Association (a nativist and virulent anti-Catholic group) who, ironically, owned that building before its purchase by the German Catholics making it a church. 9. Follow along to South 3rd Street and turn right, on the corner of South 3rd Street and 5th Avenue South is the YMCA. In 1905 the building, designed by Clinton architect John Morrell, was constructed following a fund drive headed by Charles F. Curtis. 10. Across the street on the corner is the Old US Post Office built in 1901. The massiveness, monumentality, use of Ionic column capitals, and other classical elements are hallmarks of Neo-Classical Revival Style. 11. Continue on the other corner of 5th Avenue South and South 3rd Street to view the Jacobsen Building. The ground-floor storefronts have been modernized and the east elevation of the building has been rebuilt and reclad. It was built by lumber baron Chauncey Lamb in 1886, and housed the Wapsipinicon Club and the Masonic Lodge. 12.Continue east on 5thAvenue South, halfway down this block you’ll see the>City National Bank*. This building was constructed in 1912 and is a classically ornate structure. In 1932 a bank robbery there shook the town of Clinton when it occurred in their community. The case was quickly solved and the robbers sent to prison. This building is the crown jewel in a wonderful and successful downtown. 13. Also, you will see the Wilson Building on the other side of the street. This was built in 1912 as the tallest building downtown and is a major landmark. The vertical lines are accented in the typical “skyscraper” fashion of Sullivan. Horizontal spandrels of terra cotta and ornament over the structural beams are suppressed so that the vertical piers can be dominant. The front façade is richly textured, patterned and ornamented – yet, the major lines of the structure still retain definition. 14.At the end of this block you will find theAnkeny Building*. Built in 1930 on the site of the Toll Block (which housed the Towle and Spreter Department Store.) The Ankeny Building is a two-story Art Deco style by architect Harold Holmes. Exterior features include steel-framed windows and terra cotta façade. The ground floor originally had five retail stores compared with the eight stores that exist today. 15.Also the end of the block on the other side is theVan Allen Building*, a National Historic Landmark. The building consists of four floors plus a basement and attic. The Van Allen Building is the jewel of Clinton’s architecture and was built in 1913-15 by the world famous architect Louis Sullivan, the father of the American skyscraper (Chicago) and the mentor of America’s most famous architect Frank Lloyd Wright. 16. 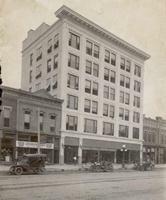 Across South 2nd Street is the Howes Building* located on the corner of 5th Avenue South. The ground-floor storefront has been altered and modernized. The Howes Building (1900) was originally constructed as a three-story building by architect Josiah Rice. The fourth floor was added 5 years later. Stuntman Money Harris did his 1935 slack wire walk between this building and the Van Allen Building across the street. You’re half way done! To continue the second mile portion of the tour go to stop #17, which includes our River Walk. Otherwise, to end the walk at the is point, continue down 5th Avenue South to South 1st Street, turn right and head back to the Museum (#1). 17.Turn left on South 2ndStreet for approximately nine blocks; as you walk, look ahead to see the Courthouse*clock tower. The County Courthouse is a landmark building of three stories with a central tower. This beautiful building was recently rehabilitated. It was built in the Ringwood section of town between Clinton and Lyons. The oxidized copper clad tower is the same color as the Statue of Liberty. At 6th Avenue North take a right and continue towards our beautiful Riverfront. On your right you will see Ashford University Field, home of the Clinton Lumberkings. Keep heading towards the river; at the top turn right. Looking on the river you will see Clinton’s new Riverfront Marina and Restaurant. Continue walking on the path the view Clinton’s Showboat Theatre. Keep enjoying your river walk as pass the Clinton Swimming Pool. Our tour will end at the Veteran’s Memorial Statue that overlooks our beautiful downtown. Simply follow the path a few more steps to the end where the Museum is located.